Charles Pavarini III conceived 'Falling Sticks' for Lucas Place Lofts, Kansas-City, MO as part of an adaptive re-use project to provide Residential Apartments in the historic garment district. 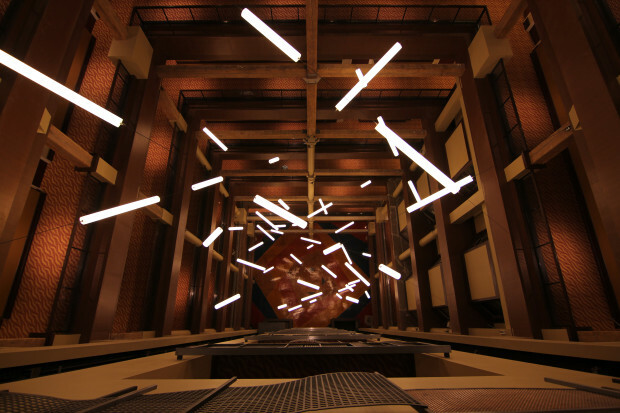 This former garment factory was re-envisioned to reflect the history of the region and the designer's custom lighting sculpture which would tie-in Kansas City's proximity to Tornado Alley. 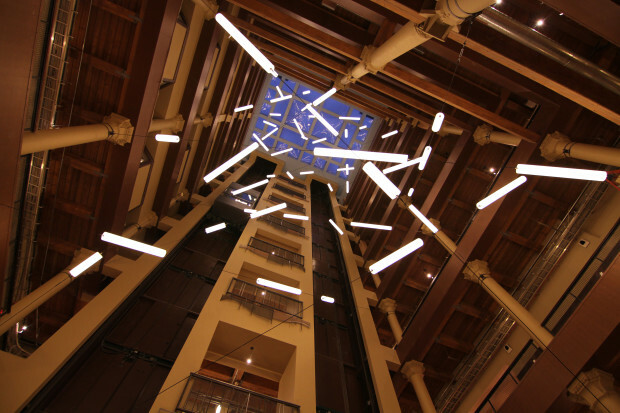 "Falling Sticks" evokes debris swirling around the atrium as if strewn by a tornado. 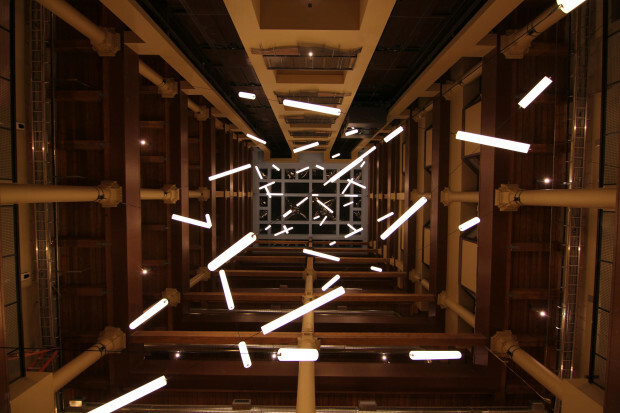 The Team developed and engineered a system of suspended, frosted LED tubes on cables supporting 6"Diameter custom LED luminaires 2’-8’L which span the balconies of the 9-story atrium. The challenge of this particular project was to solve a logistical lighting problem with the sculpture. The ceiling of the atrium was not structurally sound enough to support a hanging light-fixture, and given that the design concept stemmed from a deconstructivist approach to the architectural detail, the open atrium called-for a significant design statement to fill the cavernous space and to juxtapose the simplicity of the architecture, while providing needed ambient light. From the very beginning, Charles had this vision of a ‘floating’ light sculpture that would allow the illumination of the space to be handled artistically and to create a major statement within the interior. As the project developed, the sculpture actually furthered the design and contributed to the design of the floor, which was designed in colored Terrazzo to graphically represent the vortex or centrifuge of the tornado movement. Charles’ initial concept for ‘Falling Sticks’ was shared with the Pavarini team in sketch format. He had conceived the concept of the sculpture as cables with tubular luminaires of varying lengths placed at random along the cables, spanning balconies at different angles. From there, a proper CAD section was drawn and Lana Lenar of zeroLUX lighting design was engaged to contribute 3D modeling, to analyze feasibility, to examine installation considerations, and to develop the ideal aesthetic layout. The team collaborated on all phases of development with the manufacturer who worked with zeroLUX on the engineering of the luminaries and the details of the installation method. Site meetings were held and prototypes mounted to confirm all details in the field. The final installation is comprised of 30 individual strands of aircraft cable supporting 6" diameter custom LED luminaires. The luminaires vary in length from 2' to 8' and are randomly placed along each strand. The ongoing maintenance of such a complicated installation was a primary consideration. Each tube is illuminated by coiled LED tape for both energy efficiency and longevity. Each strand is connected to a remote driver for easy maintenance.The sculpture takes on a new personality as one moves throughout the space; the strands visually support the original concept of a Midwest tornado in the atrium.